Signal detection theory--as developed in electrical engineering and based on statistical decision theory--was first applied to human sensory discrimination 40 years ago. The theoretical intent was to provide a valid model of the discrimination process; the methodological intent was to provide reliable measures of discrimination acuity in specific sensory tasks. An analytic method of detection theory, called the relative operating characteristic (ROC), can isolate the effect of the placement of the decision criterion, which may be variable and idiosyncratic, so that a pure measure of intrinsic discrimination acuity is obtained. For the past 20 years, ROC analysis has also been used to measure the discrimination acuity or inherent accuracy of a broad range of practical diagnostic systems. It was widely adopted by methodologists in the field of information retrieval, is increasingly used in weather forecasting, and is the generally preferred method in clinical medicine, primarily in radiology. This book attends to both themes, ROC analysis in the psychology laboratory and in practical diagnostic settings, and to their essential unity. The focus of this book is on detection and recognition as fundamental tasks that underlie most complex behaviors. As defined here, they serve to distinguish between two alternative, confusable stimulus categories, which may be perceptual or cognitive categories in the psychology laboratory, or different states of the world in practical diagnostic tasks. 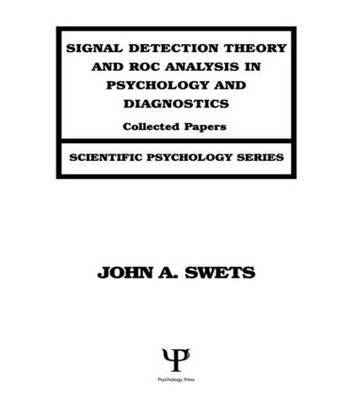 This book on signal detection theory in psychology was written by one of the developers of the theory, who co-authored with D.M. Green the classic work published in this area in 1966 (reprinted in 1974 and 1988). This volume reviews the history of the theory in engineering, statistics, and psychology, leading to the separate measurement of the two independent factors in all discrimination tasks, discrimination acuity and decision criterion. It extends the previous book to show how in several areas of psychology--in vigilance and memory--what had been thought to be discrimination effects were, in reality, effects of a changing criterion. The book shows that data plotted in terms of the relative operating characteristic have essentially the same form across the wide range of discrimination tasks in psychology. It develops the implications of this ROC form for measures of discrimination acuity, pointing up the valid ones and identifying several common, but invalid, ones. The area under the binormal ROC is seen to be supported by the data; the popular measures d' and percent correct are not. An appendix describes the best, current programs for fitting ROCs and estimating their parameters, indices, and standard errors. The application of ROC analysis to diagnostic tasks is also described. Diagnostic accuracy in a wide range of tasks can be expressed in terms of the ROC area index. Choosing the appropriate decision criterion for a given diagnostic setting--rather than considering some single criterion to be natural and fixed--has a major impact on the efficacy of a diagnostic process or system. Illustrated here by separate chapters are diagnostic systems in radiology, information retrieval, aptitude testing, survey research, and environments in which imminent dangerous conditions must be detected. Data from weather forecasting, blood testing, and polygraph lie detection are also reported. One of these chapters describes a general approach to enhancing the accuracy of diagnostic systems.